But as far as my recipes are concerned I can take some action: this kugelhopf looked beautiful, but I did not have all the ingredients around; at least in my kitchen I can do things my way. 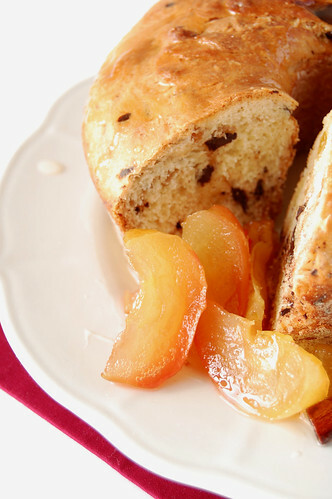 Start by making the kugelhopf: lightly whisk egg and milk together in a bowl and set aside. In a separate bowl, combine raisins and brandy to soak and set aside. Combine flour, sugar, yeast and salt in a food processor and process until mixture resembles breadcrumbs. Add butter and process for 2 minutes, then add egg mixture and process until well combined. Transfer dough to a lightly floured surface and knead for 5 minutes, adding more flour to stop dough from sticking, if necessary – I did the whole process in my Kitchen Aid, using the hook attachment, adding only 1 tablespoon flour. Transfer to a lightly floured large bowl, cover with plastic wrap and stand in a warm place for 1½ hours or until dough doubles in size. Knead dough again on a lightly floured surface, adding chocolate and drained raisins (I did not add the brandy because the dough was very soft) kneading until combined. Preheat oven to 180ºC/350ºF. Lightly butter and flour a 5 cup-capacity, 16cm-diameter kugelhopf mould*, shaking excess flour from mould. Roll dough out into a log shape, long enough to fit mould, then join ends to form a circle. Carefully place log into mould and press dough down. Cover with a tea towel and stand for about 1 hour or until dough has risen to rim of mould. Bake for 30 minutes or until golden brown, then turn onto a wire rack to cool. For honeyed apples, combine sugar, honey and water in a saucepan and cook over medium heat for 5-7 minutes or until mixture begins to simmer. Reduce heat to low, add apples, cinnamon and 1 ½ tablespoons brandy and simmer for 15-20 minutes or until apples are tender and caramelized. Remove from heat and stir in remaining brandy. Set aside to cool. 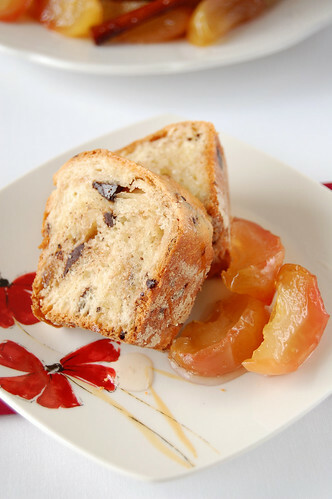 To serve, transfer kugelhopf to a serving plate, place honeyed apples around cake and drizzle some syrup over cake - I found the kugelhopf a little dry on its own, but the syrup solved that problem. this is spectacular! I like the addition of the honeyed apples. Sounds delicious! What a great way to use apples! Sometimes apple pie, as wonderful as it is, can be boring. I would love to try this with Pink Lady apples! This looks lovely - so very elegant and deluxe. i like your little plates with the red flowers as well! My god, Patricia, this is is major food P*rn. :D Looks so good! Worth all the effort you had out in making this. The picture looks so enticing. I really wonder how delicious it must be. 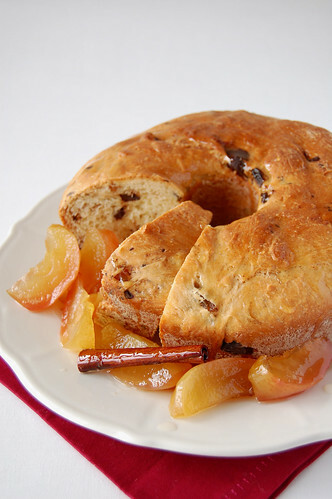 This is the first time I hear about kugelhopf and it looks amazing! Thanks for sharing your recipe! The apples were so good, even on their own. Valerina, thank you! I love baking with apples, their smell take over the whole kitchen, yum! Julia, I would love to have you over for a slice of this and a cup of tea, sweetie! Joy, haha, you crack me up, darling! Katie, thank you! I'm a huge spice fan. This looks absolutely gorgeous Patricia! I love the way the crust was formed. Looks delicious - I like the sound of a more bread/brioche like kugelhopf as I have mostly eaten more cake like ones (if that makes sense!). I will have to give this a try.